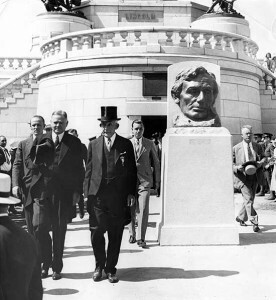 President Herbert Hoover rededicated the Lincoln Tomb in front of a massive crowd on June 17, 1931. The occasion was the reopening of the tomb following a complete reconstruction, including a new interior. When the memorial was erected in the 1870s, designers focused on the exterior. The only part of the inside of the tomb accessible to the public was a room at the front, the rotunda. Visitors had to view the burial chamber from outside, peering through a door fitted with an iron grille. By the 1920s, the tomb was in general disrepair, thanks to poor engineering, shoddy construction and persistent water leaks. Prodded by Chicago newspapers, state officials moved to remedy its structural problems and redesign the interior to “transform the monument into a hallowed shrine.” In the end, the structure had to be dismantled and rebuilt for the second time in its less-than-60-year history. In the process, the tomb’s interior was transformed. The burial chamber was enlarged and interior corridors constructed so people could reach the chamber from inside. Instead of undecorated plain stone, the walls and floors were faced with marble. The ceiling of the rotunda was covered in palladium leaf and that of the burial chamber in gold leaf. The dedication events on June 17 were viewed by 40,000 or more spectators, according to contemporary estimates. 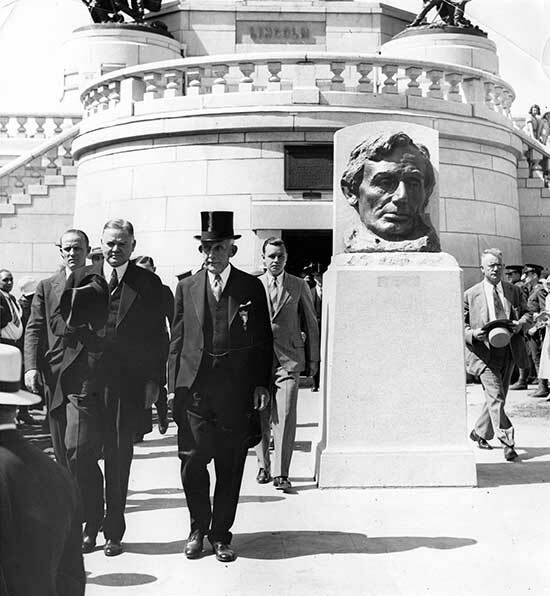 Arriving by train at 9:15 a.m., Hoover and his wife, Lou, visited the Executive Mansion and toured the Lincoln Home, and the president spoke to a joint session of the General Assembly before the motorcade to Oak Ridge. The crowds, however, generally were silent. “Most of the spectators were so busy sizing up the chief executive that they forgot to cheer,” the newspaper said. Only when he arrived at the speakers’ stand — a canvas-topped platform southwest of the tomb — was Hoover greeted with “vigorous applause,” according to the Journal. Ten thousand seats had been set up in front of the platform, and thousands more people stood wherever they could see the speakers. “A scorching sun made it uncomfortable for a large portion of the crowd,” the Journal noted. The address itself was a conventional tribute to Abraham Lincoln. “It is a refreshment of the national soul to assemble in these places and to direct the thoughts of our people to these occasions and to recall the men and their deeds which builded the republic,” Hoover said. Overall, the dedication went off with few glitches — traffic snarls, a marching band that interrupted Hoover’s speech to lawmakers, and eight pickpocket reports. However, the Journal concluded two days later, Hoover’s visit wasn’t very exciting, either. “Some good people were disappointed because his arrival was not greeted with a notable display of excited enthusiasm,” the newspaper’s editorial page noted. Sources: “The Transformation of Lincoln’s Tomb” by Nancy Hill, Journal of the Abraham Lincoln Association, Winter 2006; Illinois State Journal, June 17-19, 1931. See also: “Flashback Springfield” in the June 17, 2013, State Journal-Register. This entry was posted in Celebrations, Historic Sites, Lincoln Tomb, Lincoln, Abraham, National Register, Presidents and tagged Herbert Hoover. Bookmark the permalink.